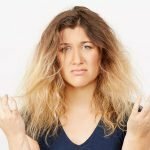 Dry, dull, haggard hair is often the result of the daily styling, frequent chemical waves, discoloration, the use of hot appliances (ironing, plaque, etc.). 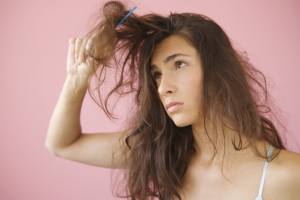 Bad habits and the influence of the environment also have the negative impact on hair health and appearance. In addition to the correct basic care, it is necessary to use an additional moisturizing, restoring and saturation of the overdried and damaged hair. With this purpose you can use the homemade masks for dry hair. 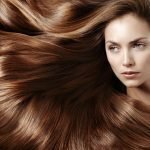 Moisturizing is the guarantee of beautiful, shiny and healthy hair, which is why moisturizing hair masks have become an integral part of hair care at home. Very often women complain that they do not see the effect of home moisturizing hair masks. But if you comply with the technology, a moisturizing hair mask at home will not be worse than that of a beauty salon. Here you will find all necessary tips how to prepare masks for the dry hair at home. 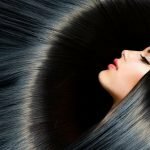 Follow the instructions and you will definitely achieve the goal of having beautiful and healthy hair. 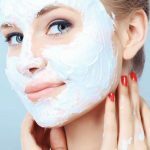 Moisturizing mask should be applied to clean hair, which distinguishes home moisturizing masks from most others that are made before washing your head. 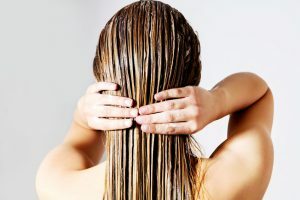 Therefore, wash your head with shampoo, pat yourself with a towel and lightly dry hair (so that it is wet but the water does not drip from hair). When hair is clean, the moisturizing components of the mask will soak up much better. It is very important that the home moisturizing mask is spread over the entire length of the hair, from the roots to the tips. A comb with wide teeth can be used for this purpose. After applying the mask on the head, you need to create a thermal protection for your hair, so that you can protect the wet head from the cold and create comfortable conditions for absorbing the moisturizing mask. Therefore, immediately put on either a shower cap or cellophane bag, and then for greater heat it is desirable to tie a handkerchief or towel on top. At home, moisturizing hair masks are held longer than others, from half an hour to an hour and a half, consider this in your schedule. 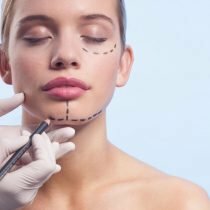 You will be given the exact amount of time for each of the below home masks separately. 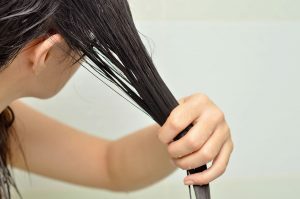 Wash off the moisturizing hair mask with warm water, which temperature should be about the body temperature (37 degrees). 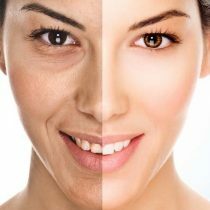 Apply home moisturizing mask for preventive purposes once per week, for the treatment – 3 times a week. 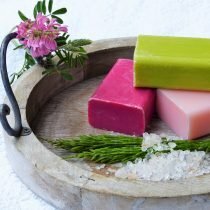 Slavic women traditionally made home moisturizing hair masks from sour-milk products, which perfectly nourished and moistened the hair – it is enough to remember which braids Slavic girls have. Take sour milk, curdled milk, kefir, and make of any of the presented options an excellent moisturizing hair mask. and distribute the mass along the entire length of your hair. Advice: Make this mask when you have 30-40 minutes, after which the mask should be washed off. You will be pleasantly surprised how effective this simple mask moisturizes the hair. About the fact what has appeared earlier, the hen or an egg, people argue till now, but concerning the efficiency of an egg mask for humidification of hair there are no disputes as everyone would agree with this statement. 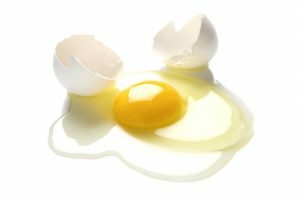 If you have dry hair, you only need yolk, if fatty – then take only protein. Girls with normal hair can take the whole egg. Put on the cap for about 20-25 minutes. Advice: Rinse hair with shampoo for your hair type. You will need a glass of natural yogurt, without sugar, flavor and color additives, and orange. Mix it with yogurt, and add there two spoons of flour or starch and mix again. It is important that you apply the mask immediately after the preparation, so that the effect of moistening is maximum, apply it over the entire length of the hair. Advice: You can remove the mask and wash your hair after 20-30 minutes. 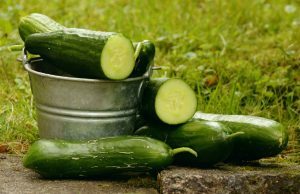 Everyone knows that water in a cucumber takes up to 80 percent of its volume, and the water is not simple, but structured. Therefore, it is natural to use a mask with a cucumber to moisten the hair at home. grate it and rub it into the root and length of the hair for half an hour. But you can also diversify it, for example, adding 2-3 tablespoons of natural yoghurt without sugar to the cucumber, which contains a large number of useful substances. 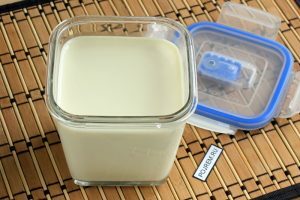 Advice: You can also replace yogurt with a good sour cream, but without any chemicals, so it’s better to take a homemade, from the market. A mask with oils is an ideal home solution for moisturizing dry hair and hair with damaged ends, because the oils are able to penetrate deeply into the structure of the hair and form a protective film, while retaining moisture inside. 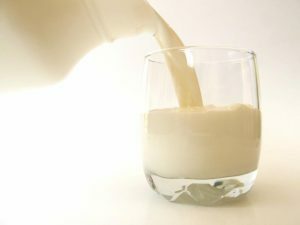 Mix in a glass dish for 1 tbsp. 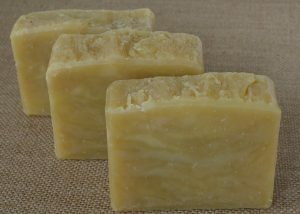 l. olive, almond and castor oil (they are all sold in pharmacies). Add 4 drops of essential oils (a choice of lavender, ilang-ilang, geranium, tea tree, rosemary). Apply the mask on the hair for about half an hour. 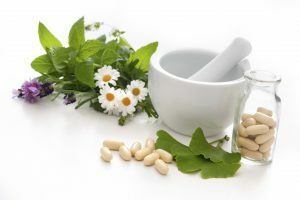 Advice: If you have allergy to one of the mentioned oils, you should avoid using it as there is a possibility that you will have an unwanted reaction with the skin of the head, for example, an itching of the scalp. 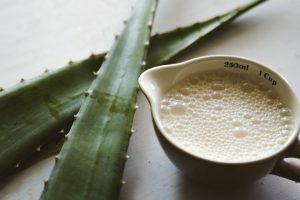 Home moisturizing hair masks with aloe have the most wonderful reviews among the beautiful half of humanity – they moisturize hair and reduce the fragility. 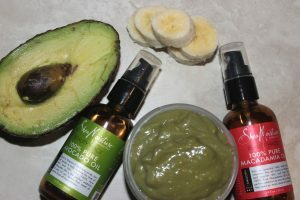 This moisturizing hair mask can be safely called also a home healer . Then follow the rules, which you have got acquainted with at the very beginning of the article. Moisturize your hair with this mask for one hour. Advice: If you have very dry hair, you can use this mask three times per week to treat it. 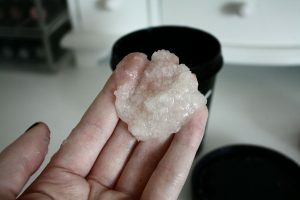 Gelatin is a simple and cheap way to moisturize hair at home, make hair shine again, and restore strength. It is used for home lamination, since it seals well the exfoliated scales of the hair and fills any damage. Pour 2 tbsp. of gelatin with 4 tbsp. of cold water. Wait until the gelatin swells, then put in a water bath. 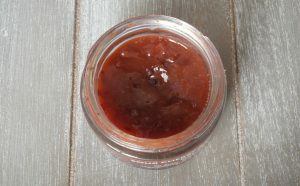 After the gelatin has completely dissolved, remove from heat and allow it to cool slightly. Advice: Spread the mask to the entire length of the hair, hold for an hour and rinse. This moisturizing hair mask at home works universally: honey brings useful nutrients to the hair, and glycerin (which can be replaced with burdock oil) closes the hair scales, so you get a double effect. This moisturizing mask works fine at any age, reviews about it are most positive. Distribute the composition carefully to the hair and scalp. Hold for 40 minutes, then rinse. 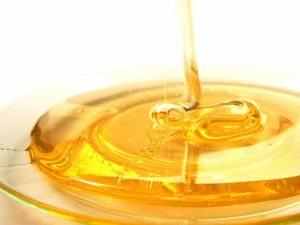 Advice: You can buy glycerin at any pharmacy while it is better to use the natural honey, not the one you bought in the supermarket. Excellent results for dry hair at home are shown by a mask with a banana and cucumber. Both these products, as you know, contain moisture already at the cellular level, so the moisturizing effect of this mask is noticeable almost immediately. add two tablespoons of olive oil and rub into the scalp for half an hour. then just rinse your hair under running water, if necessary, you can use shampoo. Advice: Apply this moisturizing hair mask twice a week with a break of 3 days. If you add herbs in your usual balm rinse, then you get an excellent product that will retain moisture in your hair and protect against stratification and brittleness. Pour a mixture of these herbs with the liter of boiling water (1 teaspoon of each of the ingredients), infuse for about 1 hour. Then apply to the hair for about 20 minutes. You can rinse with shampoo for your hair type. 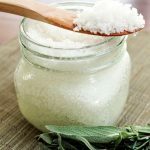 Advice: To moisturize the hair, the following essential oils have proven themselves: ilang-ilang, orange, sandalwood, rosewood, incense, chamomile, myrtle. Adding 3-5 drops in shampoos, balms, and home moisturizing masks, and also simply in water, which rinses hair, you will get a great effect. This mask is able to restore shine and hair elasticity. It nourishes and strengthens dry hair. Castor oil – 3 tbsp. Coconut (or peach) oil – ½ tbsp. Sweet-fat pork fat – 1 tbsp. Apple vinegar – ½ tsp. 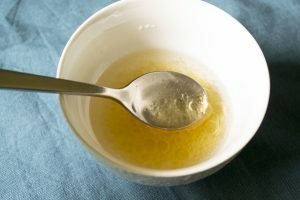 Melt the oils and lanolin in one bowl, while simultaneously heating the water in a water bath in the other. Then, combine the water with the oily liquid and continuously stir until homogeneous, add the vinegar. When the mass cools down, you will get a nourishing cream. Apply it to the scalp and hair, from above wrap the head with a film and wrap it with a hot towel. After half an hour, wash the mask with a shampoo. Advice: To enhance the nutritional effect in the mask, you can add a fresh chicken egg. The mask nourishes the roots and scalp, strengthens the hair effectively. 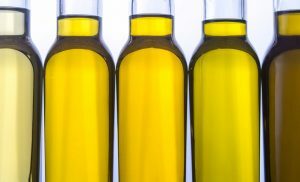 Oil (olive, burdock, sea buckthorn, linseed, almond) – 1 tbsp. Chopped horseradish – 1 pc. Thick sour cream – 1 tbsp. Grated mass of horseradish is placed in a ceramic or glassware, add butter and sour cream. Homogenous mixture is applied to the scalp, wrapped with polyethylene on top and warmed with a towel. Advice: Apply the mask for 30-40 minutes, wash your head with a shampoo. Rich in proteins, fatty acids, vitamins B and C, zinc, potassium and iron, coconut butter will definitely be one of the best means for caring for dry hair. Buy a package of pure unprocessed coconut oil and apply it to your hair if your hair suffers a long stress (severe winter cold, a strong summer sun) or if you notice that everyday hair care does not give the desired results. wrap the hair in a warm towel and leave for 20-25 minutes. Advice: Wash off with shampoo and conditioner as usual. Cut the dry ends of hair once every thirty days. When painting hair, you should give preference to natural and gentle means, do it preferably not more than once every 1.5-2 months. When laying, you cannot use gels, preference should be given to foam or cream. Wash dry hair no more than once in seven days. Include balms and masks in the complex hair care, the action of which is aimed at restoring hair structure and increasing elasticity.